Sometimes I screw up. And sometimes I really screw up. 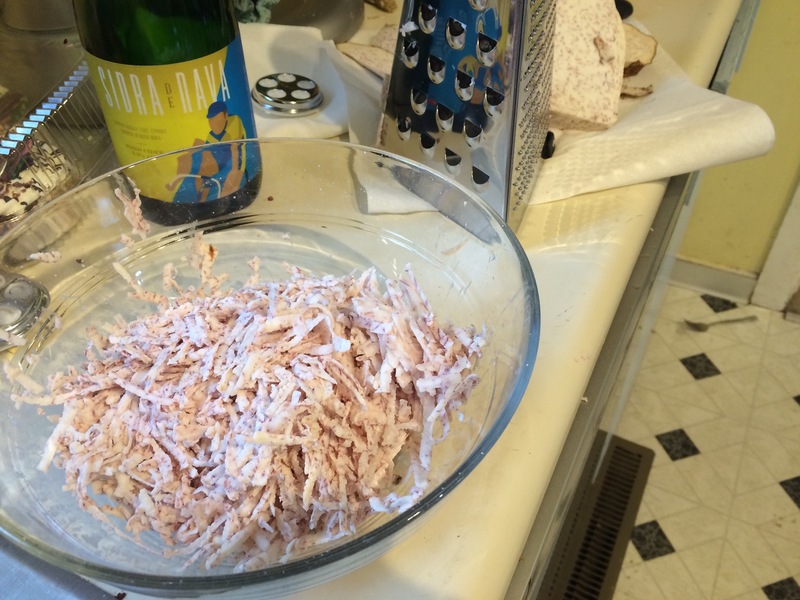 Grated taro (and unrelated, Basque sidra) ready for placement in the Corningware. I really anticipated this being a fun dish. Lap lap is one of those earthen-pit-fire-cook meals, where the traditional method is one of those badass pit fires that sears and smokes meat all day and is ready by dinnertime. Subbing for an earthen pit, in this case, would be a smoker and a piece of Corningware. The smoker was an excellent birthday present from Emily, and has been in a regular rotation since August to produce great chicken, ribs and other smokey concoctions. 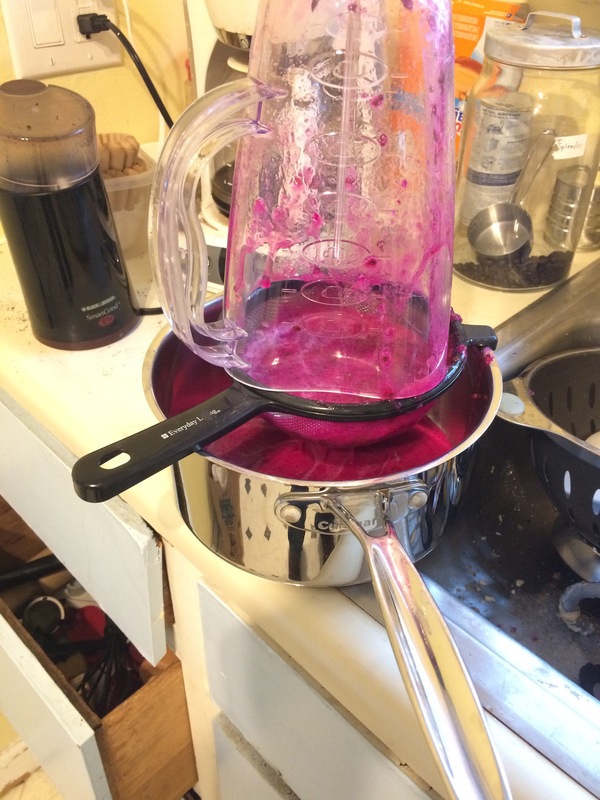 While the chicken was brining, I made some prickly pear juice from the pears outside my house. On cook day, I carefully put some banana leaves into the corningware, then shredded a big taro tuber and piled the shredded taro into the banana leaves. I brined a chicken with a whole 3 Tb of salt, soaking it for 4 hours in the fridge. I picked up some red oak wood chips to provide some variety from the usual apple and cherry woods. At about 3 p.m., I took the bird from the fridge and put it on top of the taro cake, which I’d added coconut milk to for moisture. 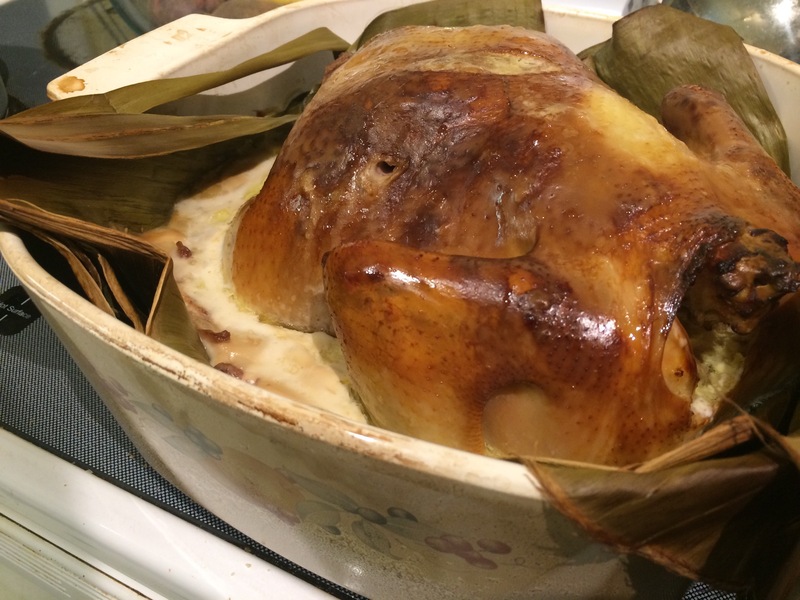 I put a banana leaf on top of the bird, to help seal in some moisture and smoke. Bird went outside, smoke got turned on, and 4 hours later, I’d have a delicious smoked chicken, right? Around 7:15 p.m., the bird finally reached 165º, so I pulled it out, eagerly anticipating my prize. But when I pulled the bird off the taro cake to slice it, it became abundantly clear that the chicken wasn’t yet cooked. 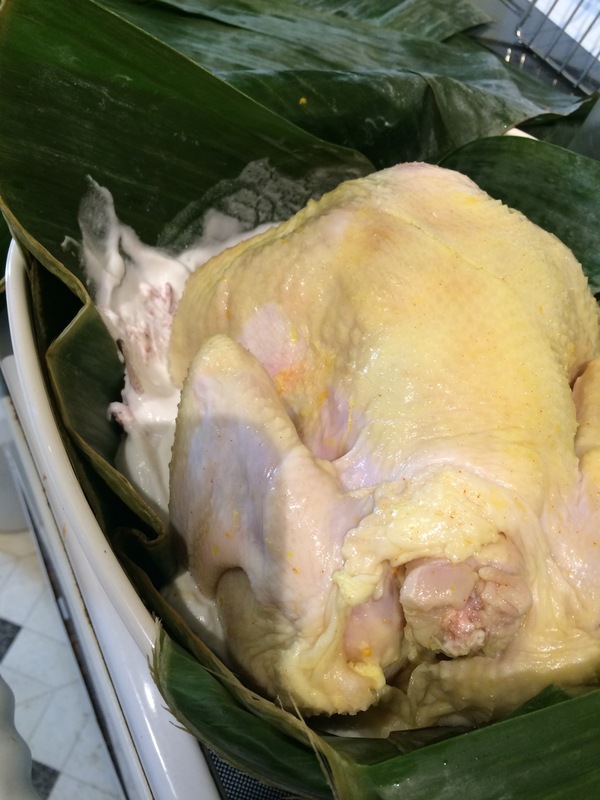 Brined chicken on the taro. Of course, Emily and I already had chicken and taro on our plates, and we were hungry. 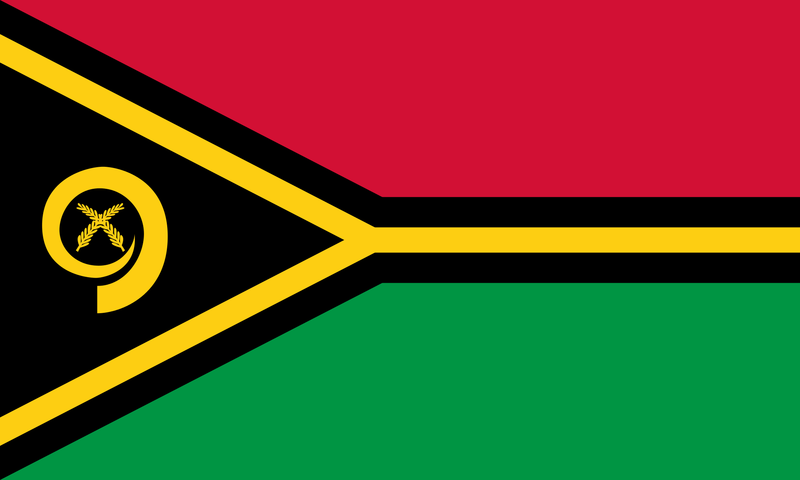 We microwaved our food, put the chicken back on the taro, and put it in the oven for another hour to wrap it up. We wound up tossing the taro, because the oak smoke didn’t leave it with a great flavor, and out of fear that I never properly cooked off the germs. But at least I learned a valuable lesson about the smoker – use caution when cooking with liquids. Red oak wood smoking the laplap. Marinade the chicken with the ingredients, add water for the brine, for at least 4 hours. Put a banana leaf onto an earthenware dish. Mix the grated taro with 1/2 cup of coconut cream. Spread it onto the banana leaf. Add the tomatoes. Place the chicken on the taro. Drizzle with some coconut milk. Cover with a banana leaf. 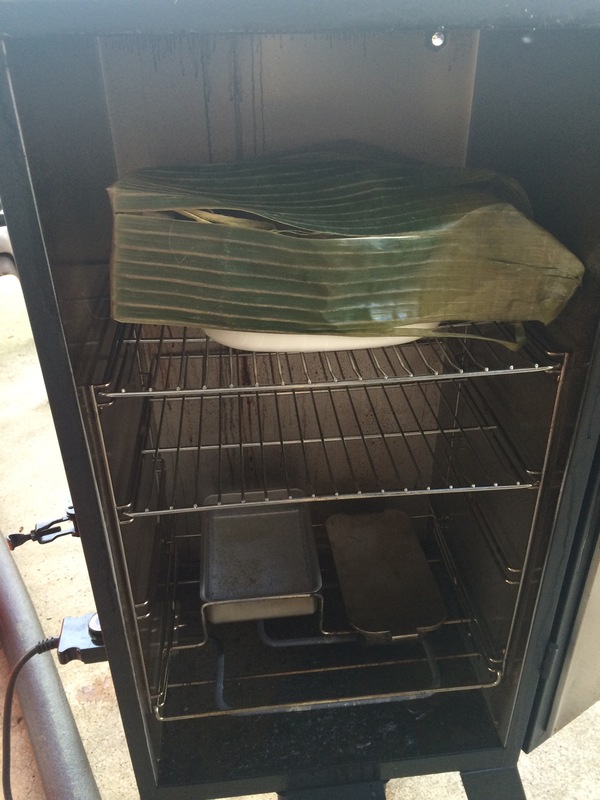 Place in a smoker until everything reaches 165°. Looks pretty. Still not hot enough. Potentially lethal!